Many elements make up our world; they are helpful as well as harmful. When it comes to growing cannabis, your choice of medium is important. Moreover, the elements growers feed their cannabis are the factors that determine their plants’ life, their yield and their overall health. Keep reading for a WeGrow guide to the periodic elements that you should include in your soil. They will surely boost the growth of your garden! The average grower recognizes Nitrogen as a ‘fertilizer’. However, Nitrogen possesses many other beneficial properties. For cannabis to produce the proper sugars as well as photosynthesize effectively, Nitrogen is crucial. Thanks to this macronutrient, your cannabis yields those luscious thick hunter green leaves and bountiful buds. Conversely, most professional growers will inform you that your cannabis needs less Nitrogen during the flowering stage. Second, we have Potassium (K). Most people hear the term ‘potassium’ and think of bananas. However, growers should understand that this macronutrient is also extremely integral to the health of your plants. Growers also recognize this element as a fertilizer. They use potassium to promote effective water use, deter harmful pathogens and even strengthen their plants on a cellular level. 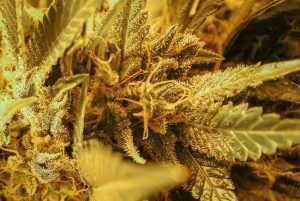 Moreover, growers use potassium to prevent the yellowing of their plants’ leaves, which is a symptom of a cannabis plant stricken with a plant disease. By including the proper percentage of Potassium in the soil, they are sure to promote the overall vitality of their garden. Lastly, we have Phosphorus (P). This element is also a macronutrient with its own share of tremendous properties. Similar to Nitrogen, Phosphorous plays a huge role in the photosynthesis of your cannabis plants. Thanks to Phosphorous, the energy absorbed by the cannabis plant can be effectively distributed throughout its parts. The metabolic control held by Phosphorus is essential to the overall plant health. Growers who add the appropriate amount of Phosphorus to their soil can yield fantastic results when it is time to harvest their cannabis. Now that you have a better understanding of Nitrogen, Phosphorus and Potassium, it is time to learn the balance between these macronutrients. Brands group these three fertilizers together as ‘N-P-K’ due to their periodic table representation. All plants, including cannabis, need a certain percentage of the 3 for optimal vegetation and flowering. Professional growers will tell you that high levels of Nitrogen as well as Potassium coupled with high Phosphorus levels during the vegetative stage is quite ideal. When flowering your cannabis, it is preferred that growers substantially cut back on the Nitrogen while providing medium and high levels of phosphorus and potassium respectfully. Be sure to subscribe to our e-newsletter to stay in the know on all grow tips, products and all things cannabis! Here at WeGrow, we like to see our growers thrive! That’s why we arm you with all the latest and exclusive cultivation tips to make your harvests the best they can be. Because not everything concerning your plants’ health has to come from the inside of the plant, WeGrow is here to help. 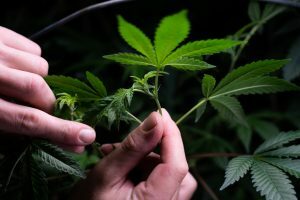 ‘Fimming’ and ‘Topping’ are two techniques that all growers should know. 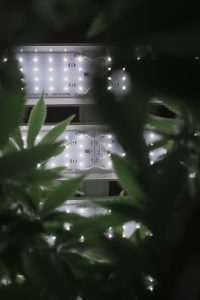 Timely cropping is effective for many different varieties of plant life, but it is especially important for indoor cannabis cultivation. Keep reading for an exclusive guide to the specific advantages and uses of ‘fimming’ and ‘topping’. Within this node, there is a new branch waiting to form. ‘Topping’ is the act of splitting open this kernel and snapping off the main vein. The more kernels you snap off the more ‘tops’ you will have. As you gain experience in this, the act will become natural to you. Doing this will create another branch, and therefore more budding sites. Unlike topping, here you are leaving the main vain intact and instead making sure to crop the leafy parts above it. Similarly to topping, however, this will cause the plant to widen and to create more budding sites. 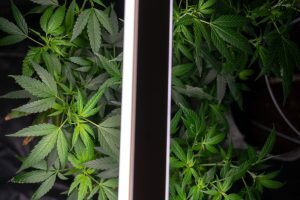 For most growers, the main difference here depends largely upon the size of your grow. If you have a lot of room to work with, fimming would be your best bet because it will really make your plants wide and robust. More branches means more buds. It is also beneficial if you are training your plants to grow more squat than tall. If you have limited space but still want to ensure optimization, topping will be your best choice. 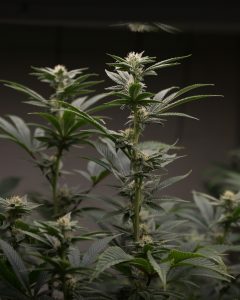 Your plants may not have the width of those that have been fimmed, however you will still get extra offshoots and more buds with this method. Cannabis cultivation is a science that depends on the diligence of its scientists. Small to mid-sized growers in the 21st century are lucky to have lots of information at hand. Growers who know how to crop their plants properly will surely reap the benefits of their efforts. 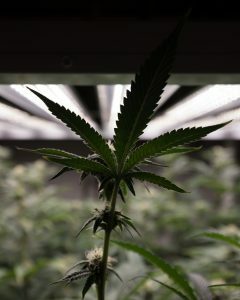 Follow WeGrow for more exclusive cultivation techniques, tips & tricks, and current news that will make your harvest the best it can be! Happy Growing!